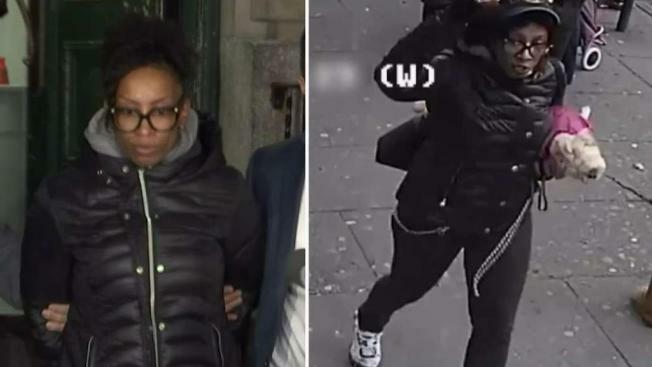 A woman who allegedly slashed two other bus riders for petting her dog has been arrested, the NYPD said. Shekema Young, 38, of the Bronx, was arrested around 2:30 p.m. Tuesday, police said. She faces charges including assault and criminal possession of a weapon, according to police. Her attorney information wasn't immediately available but she told reporters as she was led from a police station Tuesday that she was attacked first. Asked what the other riders did, Young said, "I'll tell you later." 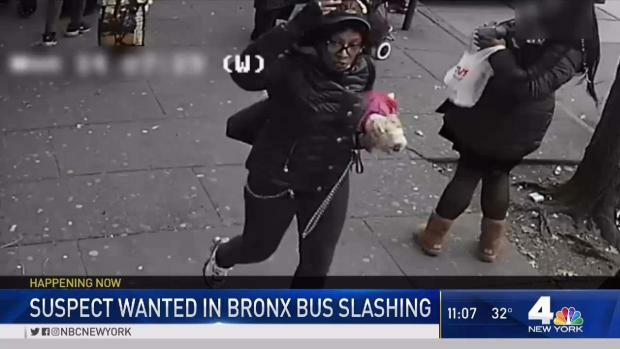 Police are looking for the woman who allegedly slashed two other bus riders when they petted her small dog Monday afternoon in the Bronx. Katherine Creag reports. Police said the victims, ages 20 and 22, were riding the Bx2 bus in Mott Haven Monday afternoon when at least one of them pet another woman's dog on the moving bus, according to police. "I got sliced in my face because I went to go touch the dog," said the 22-year-old woman, who was slashed four times in the face. "I never knew it was a service animal." "I just went to go touch the dog and she got aggravated by the fact," she added in an interview with News 4 New York partner Telemundo-47. The 20-year-old woman was slashed in the left arm. Both victims got off the bus at East 149th Street and Morris Avenue, and ran to Lincoln Medical Center. Young allegedly got off at the same location, and fled inside a green SUV taxi, police said. One witness described the shocking aftermath. "I saw a woman running around looking for a taxi, and the people were going crazy," he said. The bus was treated as a crime scene but service continued on the line, the MTA said. The 22-year-old victim now has a number of stitches across her face, all because she says she wanted to pet someone's dog. "We argued, and I was going to leave, and I went to leave," she said. "We ended up fighting and she sliced me without even knowing." MTA rules allow a pet dog to be taken on a bus as long as it's inside a pet transport bag. It's not clear if this dog was properly secured in a transport bag.